This commentary and review is based on the book Las sabidurías de la antigüedad: Contrahistoria de la filosofía, a Spanish-language translation of a book (not yet available in English) by French philosopher Michel Onfray. He is the founder of the Université Populaire de Caen, which provides a free liberal education, and is one of the most prominent public intellectuals in France today. After witnessing the rise of the right-wing ideology of Le Pen–and the intellectual decadence that led to it–, Onfray felt that the French Republic needed to invest in the formation of new intellectuals. Feeling that the academic world had failed by giving too much undeserved importance to Plato and the idealists, and too little to Epicurus and the materialists, he set out to argue that the West needs a “counter-history of philosophy” from the perspective of the “friends of Epicurus and the enemies of Plato”. To Nietzsche, truth and reality are the concoction of someone who, in the process of positing a narrative of reality, is acting upon and exerting power over reality, creating reality. … There are no facts, only interpretation. The influence of Nietzsche in Onfray was also explored in his argument that there is a Nietzschean leftist ideology, a way of philosophizing that is Nietzschean “insofar as it takes Nietzsche as the starting point”. We must start with Onfray’s Nietzschean influence because Onfray–like Nietzsche–recognizes that narrative is power and declares that we are at war. It is a war of ideas and ideologies, a war between materialists and idealists, between atomists and theologians, between creationists and scientists. Two cosmologies (in their many varieties) that can not be reconciled have been at war for millennia. We may think of them as the “culture wars” today. This is the subject of Onfray’s counter-history, and it frames his way of practicing philosophy. Onfray says that the writing of history is in itself an act of war, that it is ideological and that there is a strategy, a series of goals, and a variety of methods of writing history that demonstrate the ways in which the intellectual battle is fought. Sometimes war is waged by imposing invisibility and silence on others; at other times it is by accentuating this or that piece of evidence. Onfray starts with Plato himself, who never mentions Democritus directly, although his entire philosophy is a war-machine against Democritus. Plato’s tactic here is to ignore, to omit, to silence the enemy, so as to diminish and disregard his value. In one passage discussing Aristoxenus, Onfray narrates how Plato once insinuated that the works of Democritus should be burnt, but two Pythagoreans persuaded him not to burn them. At all times, Onfray convicts Plato of knowingly engaging in an ideological battle, a problem which is made worse by the fact that in the “official” history of philosophy, there haven’t been enough attempts to find the real voice of his opponents. The academic world has adopted the Platonic narrative and delegated Democritus in the history books to the status of a “pre-Socratic”, which trivializes his intellectual achievement as the inventor of atomism, although Democritus lived at the same time as Socrates. Democritus was born in 460, Socrates in 470. Perhaps it’s easy enough for historians to fit facts and people into neat categories, but the myth of the “three classical philosophers”–Socrates, Plato, and Aristotle–has been perpetuated unthinkingly ad nauseam by academia, and has attributed an unfair amount of importance to these three to the detriment of all the others. Onfray begins his counter-history by setting the record straight: Democritus, the inventor (together with Leucippus) of atomism and the first of the Laughing Philosophers is NOT a pre-Socratic. Democritus is the first anti-Platonist, active at the same time as Plato. Democritus and Plato start two separate philosophical lineages. The counter-history of philosophy gives us the narrative of the “other” lineage. Plato knew Aristippus–the founder of hedonist doctrine–and was familiar with him and his opinions. Proof of this is that he mentions Aristippus directly when he reproaches his absence at Socrates’ death. But instead of using Aristippus as the mouthpiece of hedonism, he used the (fictional?) character of Philebus, merely a literary figure to embody pleasure in one of his “dialogues”. Plato doesn’t let Philebus talk or defend himself properly. Plato also exhibits ill-will when he exaggerates and caricatures his hedonist opponent, and then in the end portrays the character as going off running after a boy. Why choose a fictional character to speak for a philosophy that has real proponents with real, coherent doctrines? Here, again, Plato’s war machine uses omission, silencing, ignoring his opponent, as if this demonstrated the validity of Plato’s arguments. We are reminded of how the Socrates that we know is Plato’s Socrates: we never hear of the Socrates that inspired the Cynics, or the Hedonists, or any of the other philosophical lineages that claimed him. In view of the conflict of ideas that has taken place throughout history, Onfray argues that Mount Vesuvius protected the Herculaneum scrolls from Christian fury and fanaticism; that if the eruption of 79 CE hadn’t charred the papyri, we would have never gotten access to most of the works in Philodemus’ villa. … I was still more concerned (a preference which you may be far from resenting) to strike a blow for Epicurus, that great man whose holiness and divinity of nature were not shams, who alone had and imparted true insight into the good, and who brought deliverance to all that consorted with him. This passage testifies to the fact that in the 2nd Century CE, Lucian saw himself as engaged in a fist-fight through the use of comedy and literature. Contemporary Epicureans generally hold the view that the ONLY way to understand Epicurus in depth is by understanding how rabidly anti-Plato he was: some have even argued that his entire system of philosophy can be understood mostly as a detailed, point-by-point refutation of Plato, who replaced nature with ideas. Ideas are okay, they’re just not “things” existing on their own–without matter–in the ether, or the plethora, or whatever the superstitious Platonists called the ideal realm. Epicurus’ expulsion from Mitilene by the Platonists who had assumed control of the gymnasium, under threat of being accused of blasphemy, is another pivotal historical incident that usually escapes scrutiny by historians–even by Onfray himself. We know from the sources that this was a difficult season to travel by sea and that his ship capsized and he nearly lost his life. We know that this made Epicurus careful, and that he later on avoided preaching his philosophy in the agora, preferring the privacy of his Garden. But, why were the Platonists so offended by the idea of things being made up of atoms, or by the belief that life should be pleasant? What arguments and discussions can we speculate that they had with Epicurus prior to the expulsion? Attempts to answer these questions may help to reveal many important issues of controversy, including the Epicureans’ passionate indignation with superstition and with the endless, pointless, irrelevant speculation of the other philosophers. This deserves its own series of imaginary “dialogues”. In terms of how materialists and idealists philosophize, the two lineages are either difficult or impossible to reconcile: we philosophize from the body, we value the senses, the instincts, and the faculties–pleasure and aversion. We value emotions: Philodemus treats anger as a source of insight and says it can be rational and natural, whereas the Platonists have carried out a complete denaturalization and decontextualization of morality and philosophy. They invented an unnatural split between body and mind to devalue the body and elevate the imaginary, disembodied “spirit”. This was easily dismantled by Epicurus when he re-integrated the psyche within the body. Onfray calls Platonism “the great neurosis at the heart of Western civilization”. It’s not just our happiness that suffers as a result of it. There is MUCH more at stake, including our connection with reality. Epicurus is still important and relevant today because his entire system is not only coherent, but also entirely based on the study of nature. Following the logic of “the enemy of my enemy is my friend”, Onfray brings many intellectuals from diverse traditions together, whom he sees as fighting the war against Plato. In doing so, I admit that the comparison of hedonists with cynics seems a bit forced at times. But he does note the tension that exists between nature (fisos, body) and law (nomos), between the individual (and her freedom) and the polis (and its culture), as an underlying thread in the culture wars. Hedonism does not require selfishness, or an evil joy (while seeing the suffering of others), but the construction of one’s self as a citadel, an impregnable fortress. That the Epicurean chooses to be an individual and to focus on his own self-cultivation is not to be understood as obeying some commandment to be apolitical. Onfray claims that, while Philodemus rejects the autocracy of tyrants and the democracy of the vulgar masses, he prefers a king under the influence of philosophy. The source for this is unclear, but this should not impede us from forming our own ideals for the kind of government that leads most easily to a life of pleasure, of autarchy, and of ataraxia for its individuals, as surely Thomas Jefferson–an Epicurean himself–did when he wrote the words “pursuit of happiness” into the Declaration of Independence. Perhaps a contemporary “ideal King” might be best embodied by the former President of Uruguay José Mujica, who specifically mentioned Epicurus while speaking to the community of nations, and who was subsequently celebrated at the annual symposium of Epicurean philosophy in Athens. Mujica is known for his moderate leftist-libertarian politics, for his authenticity and simple living in spite of earning a presidential salary, for his avowed atheism, and his call on all Latin Americans and Westerners to rethink the inherited values–most importantly consumerism–as “Christianity has failed us”, he says. 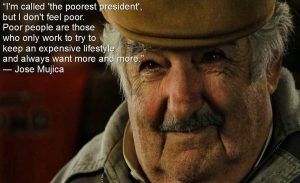 A leader who is adored by people throughout Latin America and the world, Mujica is acutely aware of the importance of disciplining our desires, and of the dangers posed by neoliberalism and by the capitalist model that requires constant growth, preferring instead a sustainable model of capitalist enterprise. Under his leadership, Uruguay has become the most prosperous nation in Latin America. It enjoys today liberal social policies, a high quality of life, and a poverty rate below 2%. Philodemus didn’t just challenge the stereotype of Epicureans as apolitical: he developed the Epicurean tradition in other ways, and challenged the stereotype of Epicureans as minimalists who live frugally. Philodemus taught philosophy to wealthy Romans–including Caesar’s own father-in-law. With him, the Epicurean tradition demonstrated–as is consistent with its own teaching–that it was willing to embrace luxuries when no disadvantages ensued from their enjoyment. This is a philosophy for men and women of all social classes. The House of Piso was not the austere Garden of the original founders. Together with its library and cultural life, it resembled more a grand temple of refined pleasure. 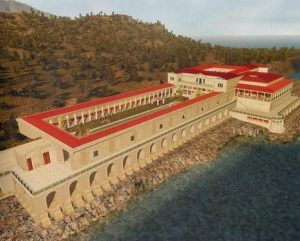 The villa at Herculaneum overlooked the Mediterranean Sea and was a fortress of refinement, culture, and luxury. We will get another glimpse into the vibrant cultural life contained within its walls when we study Horace’s Epistle to the Pisos. Antiphon of Athens was a precursor of psychoanalysis and the first to propose that philosophy heals the soul through words. This would later be paraphrased by Philodemus. He was very persuasive, invented therapeutic philosophy, and wrote a work titled “The Art of Combatting Sadness”. Maecenas, the wealthy patron of the arts whose name became synonymous with humanist philanthropy, is believed to have been Epicurean. The first companions of Epicurus were known as the kathegemones (those who led the way) and were considered members of Epicurus’ philosophical family, his philoi (affiliates or friends). From this initial group, two sets of leaders emerged: we have the Four Men (hoi andrei) who are properly considered the founders of our tradition and whom Philodemus treats as ultimate authorities, frequently citing them to underline the legitimacy of his teachings. They are Epicurus, Metrodorus, Hermarchus and Polyaenus. 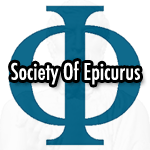 We also have the lineage of Scholarchs who succeeded Epicurus at the head of the Athens school. This article concerns these diadochi (from diadokhoi, “Successors”). Diogenes Laertius in his Lives of Eminent Philosophers, mentions by name only the first nine of these Scholarchs. From later sources, we have two more that are mentioned in the times of emperor Hadrian, and due to their recognized authority, I’m extending the term Scholarch to include all four founders. Also, in the spirit of honoring the sages, and although they do not fall within the lineage of the Scholarchs proper, there were other extraordinary teachers who contributed greatly to the spread and the preservation of Epicureanism (Philodemus of Gadara, Lucretius, Philonides of Laodicea, and Diogenes of Oenoanda). They are included here as a homage. Our tradition preserved itself through direct transmission and succession. As we saw with Philodemus, later Epicureans were very interested in preserving the teachings of the original Four Masters. Claiming a place under the succession (in his case, through Zeno) was therefore of great importance to Philodemus. Later generations of philosophers would call him “the Herald who saved us”. Read D. Laertius’ account of his life here. Metrodorus was known as a great administrator, linguist and financier, and was recognized as a sophos (sage) by the Epicureans and as “almost another Epicurus” by Cicero. He was born in 331/330 BC in Lampsachus, and died in 278/7 BC, seven or eight years before his master. He never left Epicurus except once for six months spent on a visit to his native land. He never acted as Scholarch but was among the Four Men. The son of Athenodorus, a citizen of Lampsacus and mathematician, was considered a kind man. He died prior to Epicurus in 286 BC. He never acted as Scholarch but was among the Four Men. Hermarcus, a student of rhetoric, was the successor of Epicurus as second scholarch and the first convert to the teachings of Epicurus in the early days when Epicurus first began teaching. He was born in Mitylene, Lesbos in 340 BCE from a poor family and died around 250 BC of paralysis. Hermarcus was the only one among the founders who was there both prior to Epicurus’ teaching mission, and at the time of his death when, according to Philodemus, he assisted the Hegemon, “wrapped him in a shroud, and kept vigil beside his remains“, perhaps a testimony of the tender love that existed among the first Friends of Epicurus who had grown old together in philosophy and were as family. Some of the extant sayings in our tradition have been attributed to him, and it is believed that he was almost exclusively vegetarian and that he considered meat-eating an unnecessary desire because it contributes not to the maintenance of life but to a variation in pleasure. He had been a young pupil of aged Epicurus, later attained succession as Scholarch c. 250 BCE and died 219-8 BCE. His life-long best friend was Hippoclides. Two of his writings remain: there are broken fragments of On Philosophy, and an interesting work titled On Irrational Contempt, a diatribe against the Sceptics where he argues in favor of a naturalist moral realism. Polystratus is the first Scholarch who had not been a founding member and it’s here that issues of inheritance begin to harm the school, apparently because some non-Epicurean children of scholarchs would claim inheritance. Over the long-term, this seems to have harmed the continuity of the Athenian Garden. We also know that Rome introduced legislation requiring the successors in the provincial philosophical schools to be Roman citizens in order to avoid subversion, which would later greatly diminish the number of available successors. The law would not be abolished until the second century of Common Era. He became the fourth succeessor of Epicurus in 219-8 BCE after contending for succession against Diotimos, as Polystratus had failed to designate the next Scholarch. It is most likely here that, according to Empress Plotina who wrote during the second century of Common Era, the pupils had to carry out an election to choose their next Hegemon. He was born in Syria c. 245 BCE, appointed successor in 205 BCE and died c. 175 BCE. He had been pupil of Artemon, and he taught Philonides of Laodicea. Philodemus’ writings on anger are likely based on his work. Although not a Scholarch, he was an important missionary to Asia who spread Epicureanism in the East (Phoenicia, Syria) and is hailed by NewEpicurean.com as one of the unsung heroes of our tradition. The sixth Hegemon (190-110 BC) rose to the succession c. 147 BCE and had been known as the tyrant of the Garden due to the discipline he implemented. He wrote over four hundred books and is believed to have possibly restored the finances of the Athenian school, which may be how he got his nickname. We must remember that there were inheritance issues after the four founders passed away. He is said to have written upwards of 400 books, none of which is extant and only two are mentioned by title: a Life of Epicurus and a Collection of Doctrines. Some Epicureans call the Scholarchs that came after Apollodorus sophists, a term which carries negative connotations, perhaps because of the innovations they introduced. Many of these innovations were the result of interaction and debate with other schools. Some believe they were attempts to reconcile the writings of the founders with new insights. The school had relied on memorization of sayings for many generations. Zeno was a prolific writer of over 400 books who engaged in textual criticism of Epicurus and revitalized the intellectual life of the school by rebelling against what he perceived as an inability to adapt, which is probably part of what inspired the accusations of sophistry. Perhaps the discipline he endured under Apollodorus gave him a rebellious edge? In any case, he seems to have gathered a huge circle around him and to have influenced many important thinkers of his day, including Cicero (who greatly admired his logical and noble thought), Atticus, Demetrius the Laconian, Lucretius, and Philodemus. If the greatness of a teacher can be judged by the greatness of his students, then Zeno must have been one of the great Epicurean Masters, an incredibly important figure. Philodemus’ works On Frank Criticism and On Anger are part of the Epitome of Conduct and Character, which is based on the Lectures of Zeno. Lucretius (95-52 BCE) was a poet and author of De Rerum Natura, a didactic work that gives a complete exposition of the Epicurean system. This manuscript was rediscovered in the 15th Century by Poggio Bracciolini, its influence trickled down to Pierre Gassendi (who tried to reconcile atomism with Christianity), Giordano Bruno and other naturalist thinkers. According to many (including the author of The Swerve: How the World Became Modern), Lucretius is the reason for the Renaissance and the Enlightenment. In other words, his words lifted humanity from the Dark Ages. Philodemus was not a Scholarch, but studied in Alexandria and later under Zeno in Athens, went on to teach philosophy to wealthy Romans, and preserved many of Zeno’s lectures in the library at Herculaneum. In spite of this, and unlike his master, he was orthodox in his views and often cited the original four founders in order to claim legitimacy. As a result of this, he is a hugely importance source. The importance of his work cannot be underestimated. These scrolls were destroyed by the eruption of Mount Vesuvius, but later rediscovered and many of the fragments deciphered. The remains of Philodemus’ work inspired the Philodemus Series at societyofepicurus.com and will likely continue to inspire our teaching mission. The eighth Hegemon, Phaedrus, was a wealthy Athenian who lived from 138 – 170/69 BCE, having sought political exile in Rome in 88 BCE and later returning to Athens to succeed Zeno as Scholarch c. 75-70 BCE. He was a great orator and was known for writing witty epigrams. He became the ninth Hegemon c . 70-50s BCE, and lived unfortunately during a time when the school in Athens, the house where Epicurus had lived, was in ruins. There is evidence of his efforts to save the building. With him ends the supremacy of the Athenian school (around 51 BCE), which would no longer receive donations from the satellite schools in other cities. As Epicureanism expanded in Rome as it had done in the east, there was an increased division between the orthodox (gnesioi, or authentic) and the sophistic (sophistai) wings of the tradition. By now, there were Epicurean communities in Lampsacus, Mitylene, Miletus, Thebes, Antiochia (which became a major center and even had an Epicurean library with smiling gods’ statues), Alexandria, Chalcis, Apameia, Gadara, Kos, Naples, Pergamom, Rhodes, Amastris, Oenoanda, and Herculaneum. Diogenes lived in a small town in what is now Turkey. He erected a wall with an Epicurean inscription in order to teach philosophy to the people of his town. There’s an abridged version of the contents of Diogenes’ Wall at epicurus.info, another one here, and newepicurean.com has a feature on it. During the 2nd Century of Common Era, Popilius Theotimus, scholarch of the Garden at Athens, turned to Plotina, the Epicurean empress who had raised Emperor Hadrian, with a request to abolish the law that required the successor to be a Roman citizen. She succeeded in utilizing her influence on the emperor to change the laws. As a side note, we do not know how early Plotina chose to follow Epicurus, whom she called Savior, or whether she raised Hadrian as an Epicurean, but we do have reason to believe that Plotina’s philosophy greatly influenced the emperor. It must be noted that the following words were inscribed on Hadrian’s coins: Humanitas, Felicitas, Libertas (Humanity, Happiness, and Freedom). We know that Emperor Hadrian personally wrote to the Epicurean scholarch Heliodorus, the successor to Popilius Theotimus, conceding financial support to his school. Later in 178 Emperor Marcus Aurelius renewed interest in the Epicurean school in Athens by an endowment of ten thousand drachmas. Epicurean Database Blog at WordPress.com.